As the undisputed belle of the season, Sarah has enchanted plenty of suitors. Still, she isn’t interested in marriage, especially not to the pompous bore her father has chosen for her. But her hasty escape seems reckless now that she’s estranged from her family and has no one to count on besides Christian. Turning the lucklesslord into such a catch has another unplanned consequence for Sarah: Has he run away with her heart? 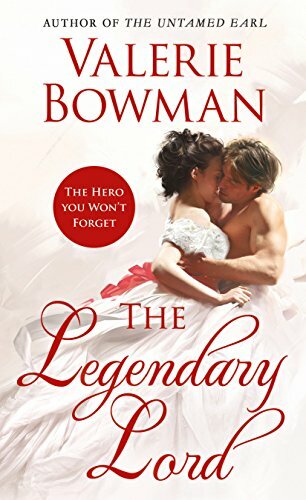 The Legendary Lord is the sixth installment of Valerie Bowman's Regency-set Playful Brides series. A lovely Regency romance, sparkling with wit and humour. Christian and Sarah make a delightful couple right from their first meeting. Sarah is young and full of cheer and has plenty of ideas to help Christian make a match in society. It left me tingling with anticipation for what was to come when the pair made their way back to London. I haven't read any of the other books in the series but it certainly didn't prevent me from thoroughly enjoying this one. This is a series I will enjoy reading from the beginning. I couldn't put this book down and I would definitely recommend it to all Regency romance fans. Thanks to the publisher for the Advance Reading Copy.